The DFG41 has been discontinued. Please see the DFG55 SERIES as a possible substitute or contact our Pressure department. 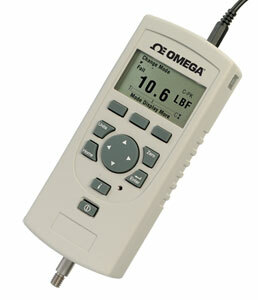 OMEGAs DFG41 Series offers the best price performance of any digital force gage available today. This compact, easy-to-use force gage is designed for basic and complex applications. Ideal for handheld or test stand applications, the DFG41 may be equipped with integral load cells or smart remote sensors for load or torque measurement. Measurement accuracy is better than 0.1% full scale with internal sensors or 0.25% with external sensors. A large, easy-to-read, high resolution dot matrix LCD supports a variety of standard gage functions including normal and peak readings, high/low limits, setpoints, pass/fail results, statistical results, load averaging, load comparisons, % and sharp break detection, load cell actuation and direction. Loads are displayed in ozf, gf, lbf, kgf and N units. The display can be inverted and displayed results may be "hidden" from the operator. The DFG41 gage comes standard with a carrying case, battery adaptor/charger, testing accessories and NIST Certificate of Calibration with data. 참고: Comes complete with hard carrying case, rechargeable batteries, universal battery eliminator, hook, flat tip, calibration certificate, and operator’s manual.